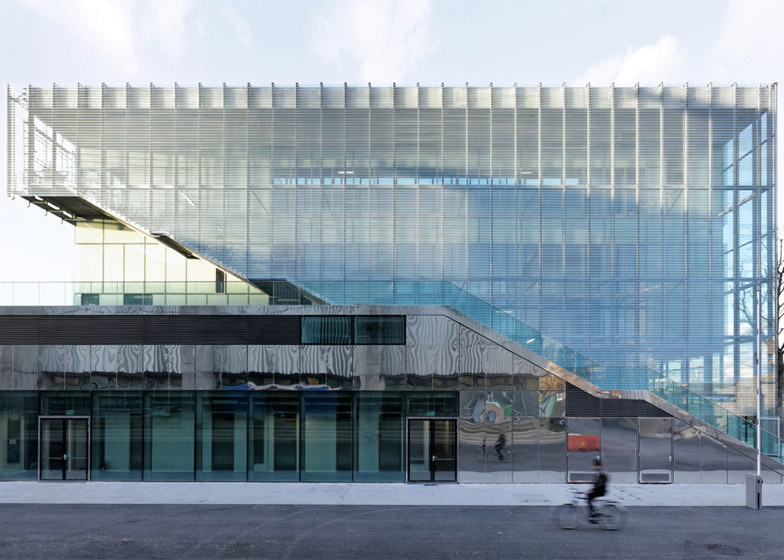 A layer of glass louvres wraps this Paris sports centre by Dietmar Feichtinger Architectes, forming a semi-transparent facade that controls the amount of light, heat and ventilation entering the building (+ slideshow). 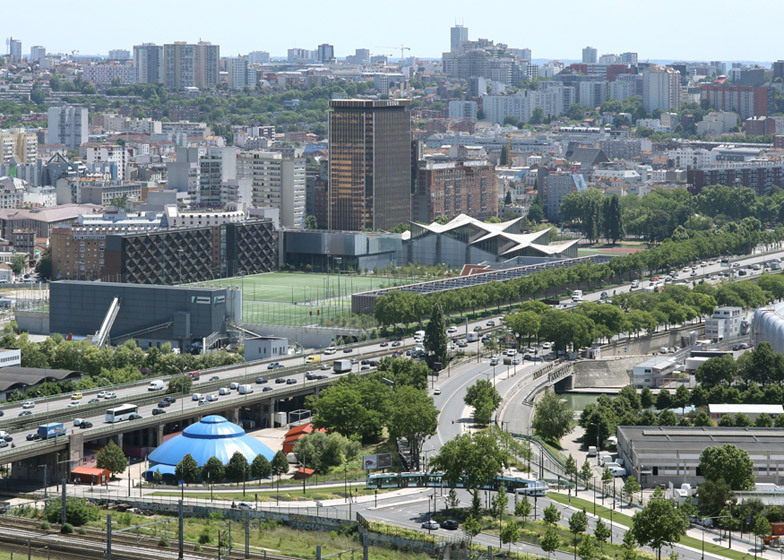 The Jules Ladoumègue Sports Centre provides new fitness facilities for the Parisian suburb of Pantin, which borders a ring road surrounding the city. 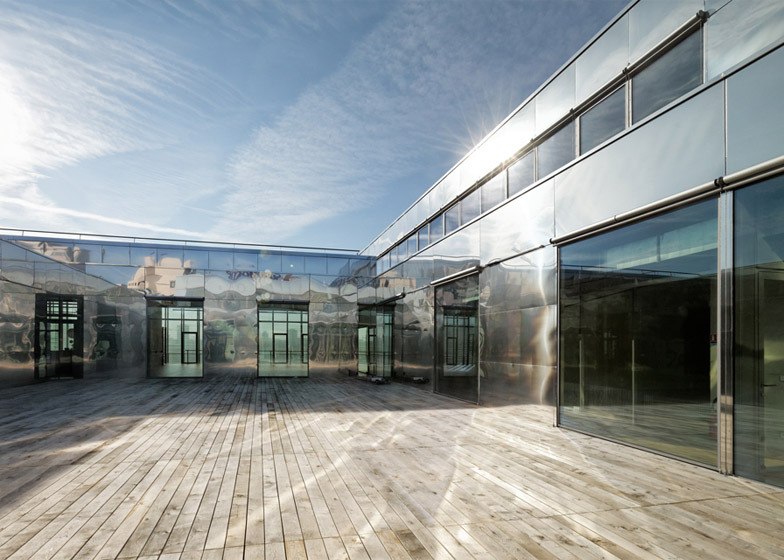 Dietmar Feichtinger Architectes – which has offices in Paris and Vienna – felt the best way to achieve an adaptable indoor environment would be to surround the building with sensor-controlled glass louvres. These open or close depending on the wind and temperature, and can also be operated manually. "Transparency is the handwriting of our studio – all of our projects champion this link between the interior and exterior," the studio told Dezeen. 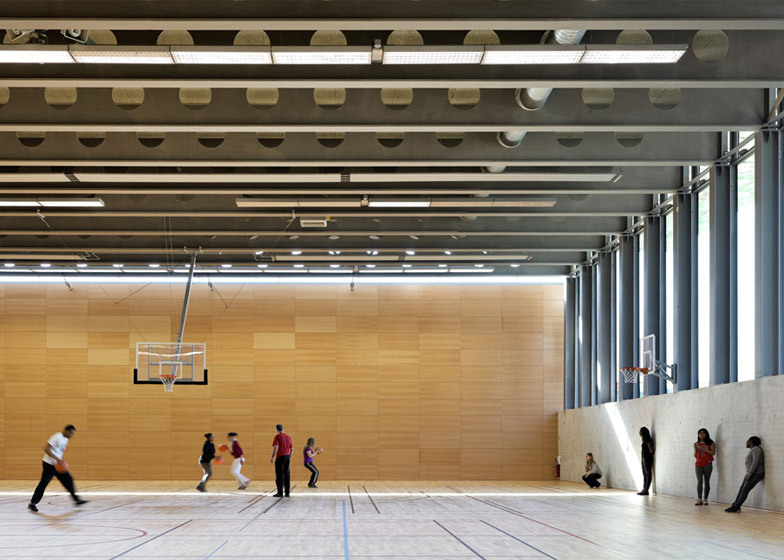 "As a public building, this gymnasium had to be an urban signal. The facades express the diversity of its functions and the exemplary quality of its climate engineering." The sports complex comprises two new buildings set around existing playing fields. 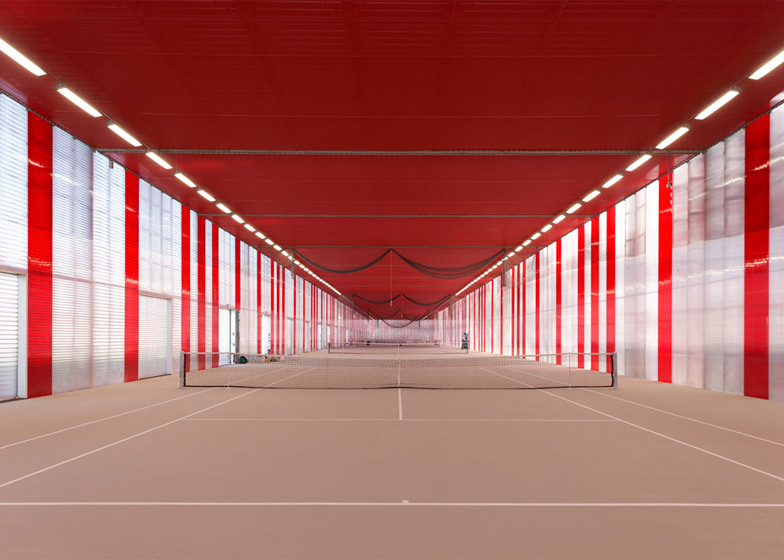 As well as the five-storey fitness centre, which is clad in stainless steel panels on its lower levels to create reflections of the surroundings, there is also a separate tennis centre at the edge of the site, with six indoor courts. The project is part of a broader effort to integrate Paris with its suburbs. It was initiated by the extension of a tramline to the city's east, which required a new maintenance centre to be built on the site's playing fields. To accommodate this without losing facilities, the architects were asked to design the two new buildings around the maintenance centre, with the tennis centre placed on top of it. 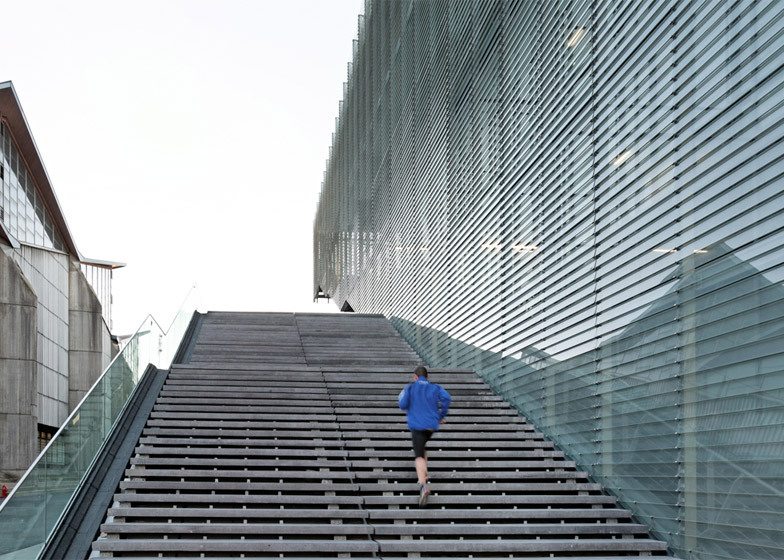 "The sports centre becomes representative of the new urban continuity between Paris and its outskirts," said the architects, whose other recent projects include a 760-metre-long pedestrian bridge to France's historic Mont Saint-Michel island commune. "The notions of space, urban integration, and functionality, as well as those of light, transparency and comfort, deeply contributed to the design," they added. The architects placed two staircases at the side of the five-storey building to make it more easily accessible from the street. One of the staircases is external, and leads to a terrace on the first floor. The other staircase is behind the glass louvres, and provides access to all levels inside. 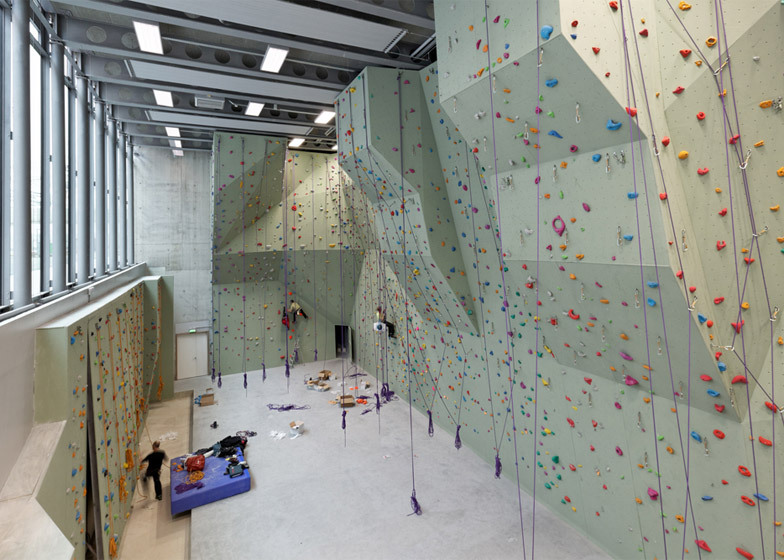 Inside, there is a triple-height climbing wall stretching from the basement to the first floor, with multi-coloured handgrips to indicate the different paths up the wall. 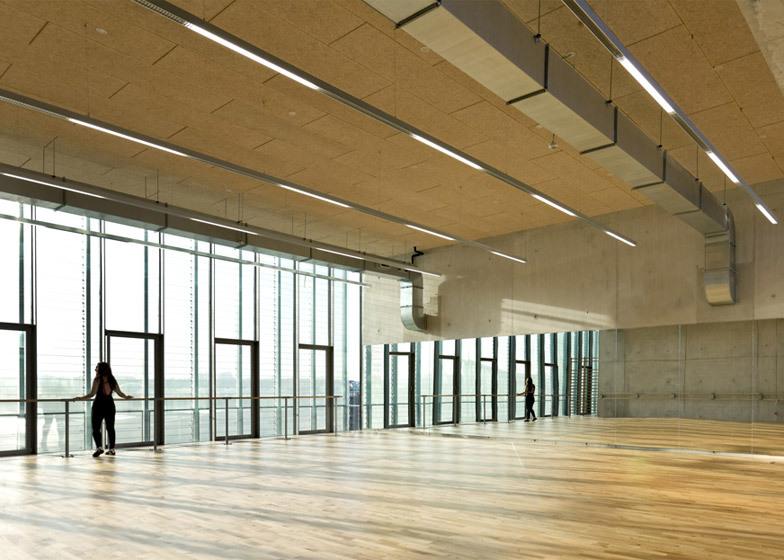 On the second floor, there is a double-height court for basketball, volleyball, badminton and handball, with micro-perforated birch walls to help muffle the sound. Showers, offices and seating areas are arranged across two levels in the space surrounding the court. The fourth floor contains squash courts, a weight room, and a double-height dance studio with a glazed wall overlooking the site, and the fifth floor houses an apartment for the building's caretaker. Wood flooring was used throughout to provide a durable surface, and the concrete structure and pipework was left exposed. "As well as the transparent exterior, we also like the interior to feel transparent by not hiding the concrete and pipework," said the architects. The dance studio, squash courts and weight room at the top of the building open on to an inner courtyard, which provides outdoor exercise space. 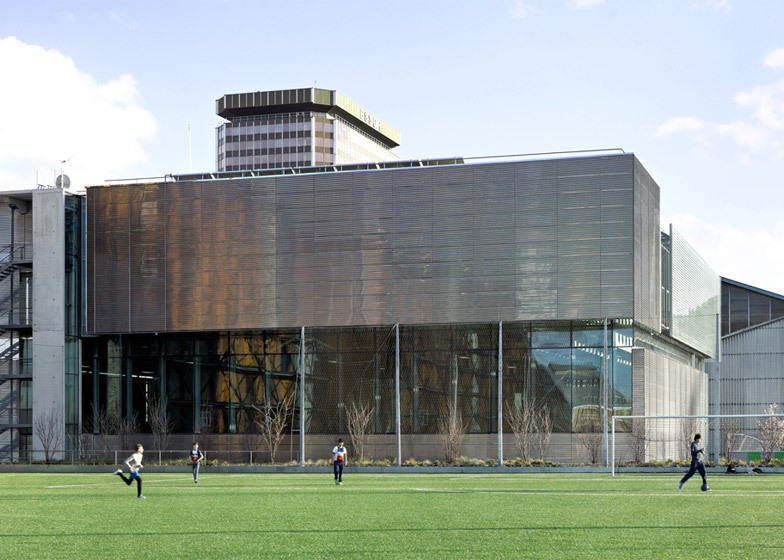 It is clad in the same stainless steel panels used on the lower levels. 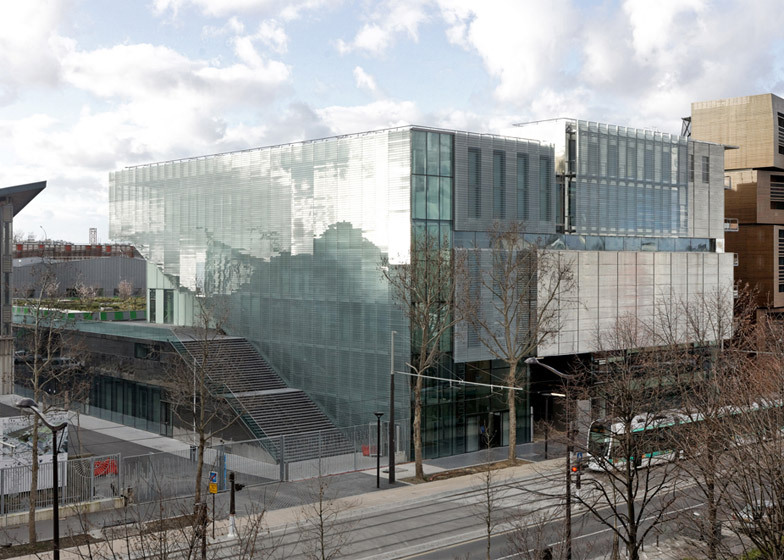 "We used stainless steel to make the facade brighter, and also for its sustainability, because it has a very long lifespan," said the architects. The new fitness centre is opposite the site's original concrete athletics centre from 1970, known as the Pagode, and the passage between the two buildings forms a more logical entrance from the street to the playing fields. "The interaction between the new building and the existing one creates a new ‘door' in front of the new tramway station," said the architects. "The expressive style of the Pagode on one hand, and the transparency and lightness of the new building on the other, creates a strong dialogue of opposites." The new tennis building at the edge of the site is covered in a double layer of polycarbonate panels. The translucent panels feature horizontal shutters to provide shade on the eastern facade, and sensor-controlled shutters are integrated between the panels on the other three sides. To enliven the 200-metre-long building's interior, the architects used a bright red finish on the ceiling. The colour continues in strips down the side walls like keys of a piano, as a reference to the nearby Philharmonie de Paris. The location of the tennis centre next to the city's busy ring road also provides an acoustic barrier for the rest of the site. Construction for the tennis centre and fitness centre was completed in two years and nine months, and the project budget was €26.7 million (£18.9 million).